Fun little plastic farm set with a vaguely retro-Euro look. 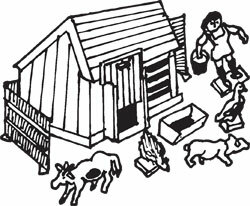 Comes complete with a farmer, a farmer's wife and a farmer's daughter, all 2" tall, along with (3) chickens, (3) geese, (3) rabbits, (4) cows and (6) pigs. The barn is 2-1/4" tall x 3-1/4" x 2". Includes barn doors, fencing and a feed trough. Maybe. 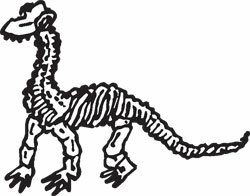 Could also be a stegosaurus, triceratops or something else--that’s part of the fun of paleontological parenthood. 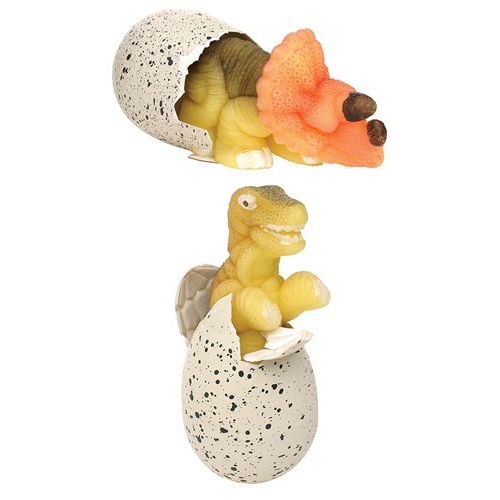 Just submerge the 4-1/2” tall ersatz dinosaur egg into cool water and wait 48-72 hours while it cracks like a real egg and the baby dino grows to a be a foot long. 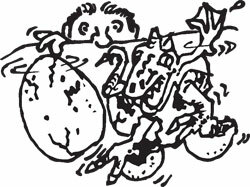 If your mother won’t let you skip your bath for a few days (they’re like that, mothers, no scientific discipline), just use any container bigger than a 12” dinosaur. Not life size, because we don’t a have a jar that big. 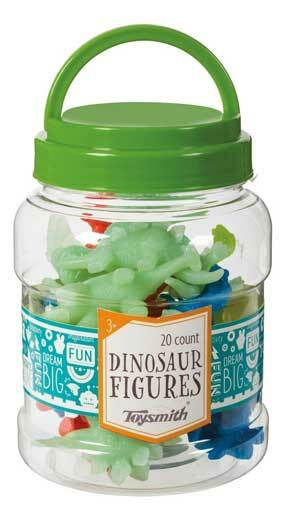 These dinos average 2-1/4” long, and you’ll get (20) of them: (10) in red, green or blue plastic, plus (10) that glow in the dark, which is better than the real thing. 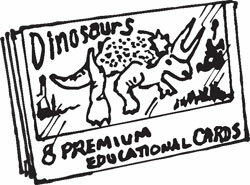 Dinos include stegosaurus, pteranodon, brachiosaurus, styracosaurus, dilophosaurus, T-rex, parasaurolophous, allosaurus, ceratosaurus and acrocanthosaurus. 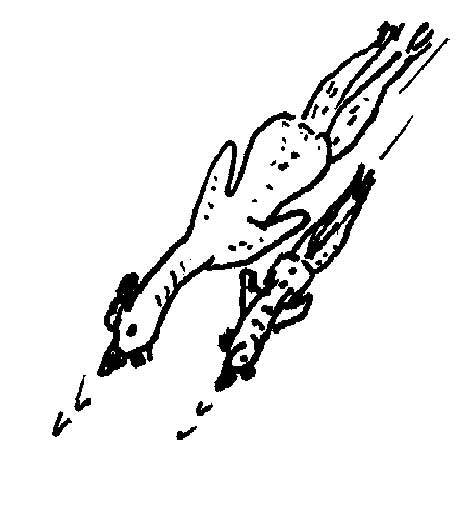 Actually, your chickens, plural, since our each is multiples of lovely, plucked and naked chickens in full chicken color. 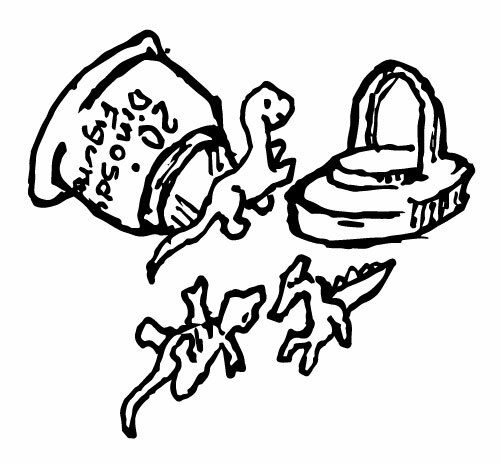 And unlike the real thing, these are small enough to carry in your pocket, because you never know. 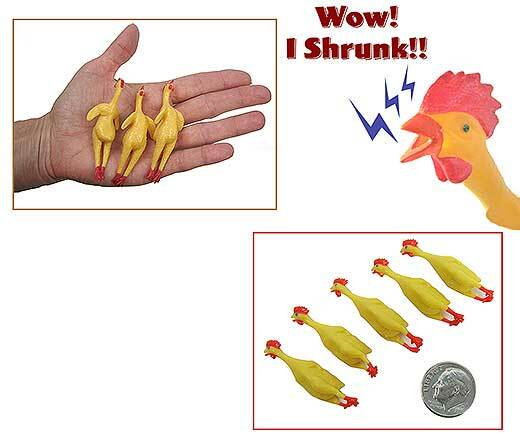 In molded plastic, you pick the dozen micro-mini pullets at 1-1/2” long, or the 3-pack of 3” long birds. Either way, you’re prepared for any chicken emergency you’re likely to encounter. 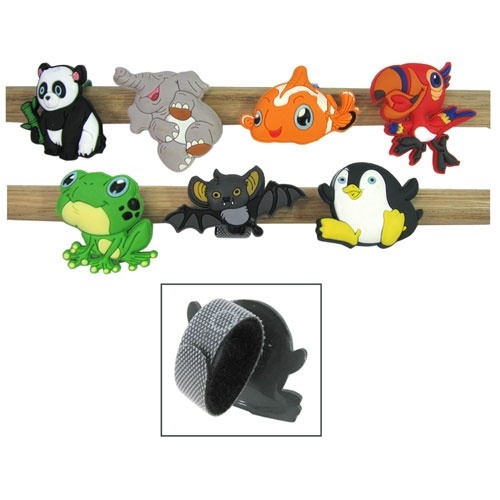 From the world of Collect 'Em All, these uber-cute little foam animal figures are 1" to 1-1/2" across with a little 3" hook-n-loop band on the back so they can be attached to fingers, flip-flops, shoelaces, backpacks, wherever kiddies think they belong. 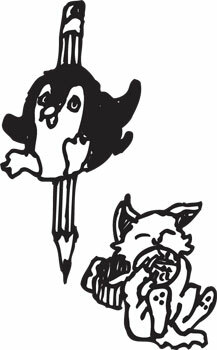 You'll get (4) different ones from the selection of frogs, pandas, monkeys, elephants, kittens, bats, fishes, penguins and toucans. Who Says Chickens Can't Fly? The possibilities are endless. 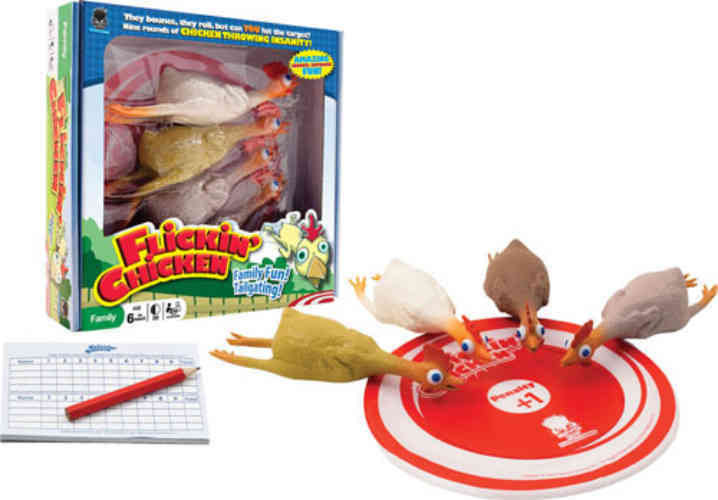 You get a set of (4) stuffed rubber chickens, 8" long and in (4) different, but chickenlike, skin tones, plus an 8-3/4" dia target to toss them at. Throw the target on the ground then fling, roll, or bounce the chickens toward it. Sort of chicken bocce, or poultry petanque. Includes game ideas and a score pad! In between chicken-throwing seasons, they make a mighty nice display lined up on the mantle. 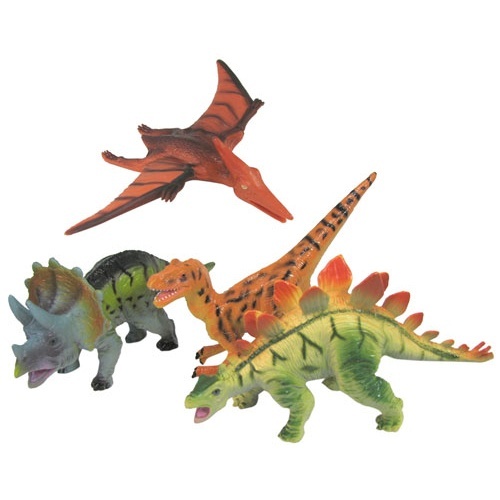 These colorful molded rubber dinosaur figures are 4" to 7" long, depending, and include a velociraptor, stegosaurus, pterodactyl and brachiosaurus, among others. 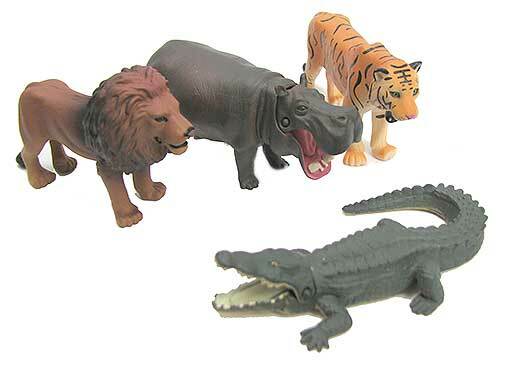 We'll pick (2) different prehistoric beasts for you from our menagerie of detailed, high-quality models, which could be used for learning as much as playing. 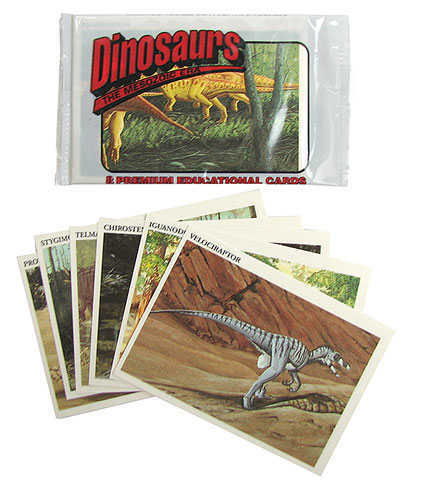 Like baseball cards, except with dinosaurs. And no gum. (You wouldn’t want surplus gum anyway.) Measure 3-1/2” x 2-1/2”, assorted and laminated, so they’ll last longer between bicycle spokes. You’ll get (4) packs, (8) cards to a pack. You can try to collect them all but we have no idea how many there are. We’re going to say lots, just like the dinosaurs themselves. If Louisa May Alcott had moved on from Little Women and Little Men to little critters, she’d have been all over this collection of beasts. All approx 3” to 3-1/2” in hard rubber with articulated jaws, so they can look vicious or contemplative. 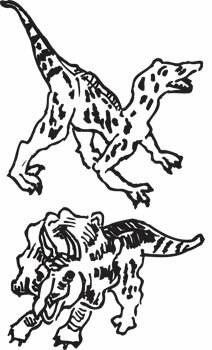 We’ll send you a pack of (3) different ones, possibly including a lion, tiger, white tiger, hippopotamus, crocodile or cheetah. Who doesn’t? 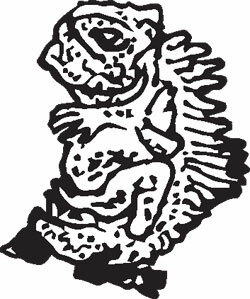 Actually, it doesn’t look all that wanton, although it’s hard to tell with lizards. It does look realistic, though--perfect for a desert diorama. 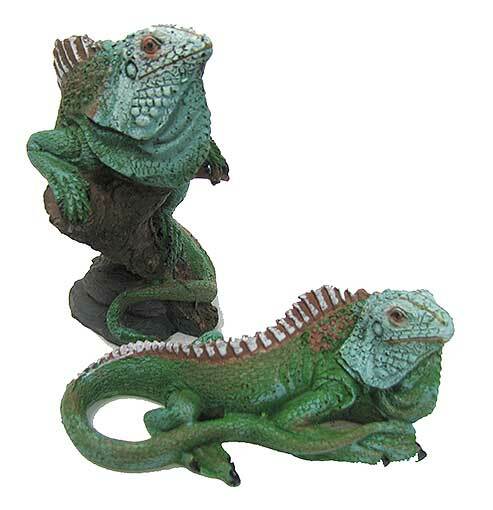 You’ll get a pair of these 3-1/4" tall polyresin iguanas, each wrapped around a little tree stump. 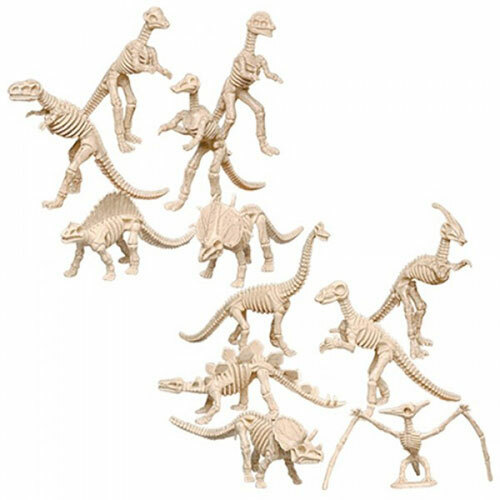 Why go dig up half of Utah when you can just line these little 6” long dinosaur skeletons up on your dresser? You’ll get (3) different ones from our collection of dilophosaurus, parasaurolophus, T-Rex, pentaceratops, triceratops, pterodactyl, stegosaurus, brachiosaurus and ankylosaurus.